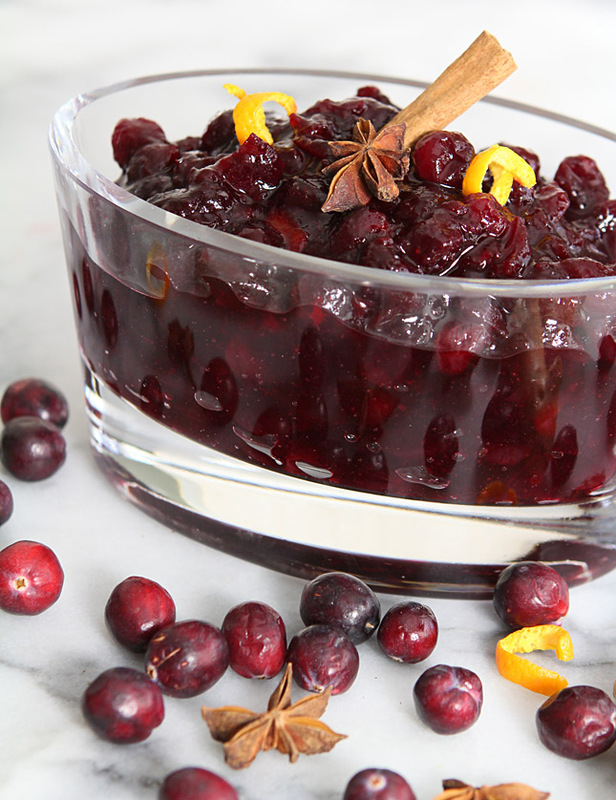 This Bourbon, Brown Sugar, and Orange Cranberry Sauce is so delicious you’ll want to just grab a spoon and dig right in! My love for infusing foods with a bit of alcohol is no place better represented than at Thanksgiving and Christmas when the cooking and baking are at a fever pitch and making something new sometimes requires nothing more than a bit of bourbon. While I will use other liquor as well as wines and liqueurs in my endeavors, it’s bourbon that wins hands down if counting where I reach first. While it’s more obvious to presume bourbon would end up in sweet treats, barbecue sauces and of course some great cocktails, the one thing I love making every year is a new cranberry sauce and this year bourbon was going to play a role. Good decision; now that I’ve done it I think this Bourbon, Brown Sugar and Orange Cranberry Sauce might be my absolute favorite. Thanksgiving without some cranberry sauce is no Thanksgiving at all for me and I was late with my annual effort but I’m so glad I persevered. I mean I REALLY love this sauce! I know…it’s AFTER Thanksgiving and I’m just now sharing with you. I can’t help it, I just love the berries, period. I could eat handfuls of sugared cranberries and might have done just that when I make this recipe for a Red Wine Chocolate Cake with Sugared Cranberries. I’m contemplating the addition of a Cranberry Mojito to Friday Cocktails this week and I seriously will want to shed a tear when they are no more. So…thinking I might be alone and the only person in the universe with such a cranberry thing, I did take a very unscientific poll on Facebook about the interest in having me share a recipe for cranberry sauce. Should I do it now or wait until next year? The response was resounding; as a matter of fact it was a totally lopsided vote…all said do it NOW! 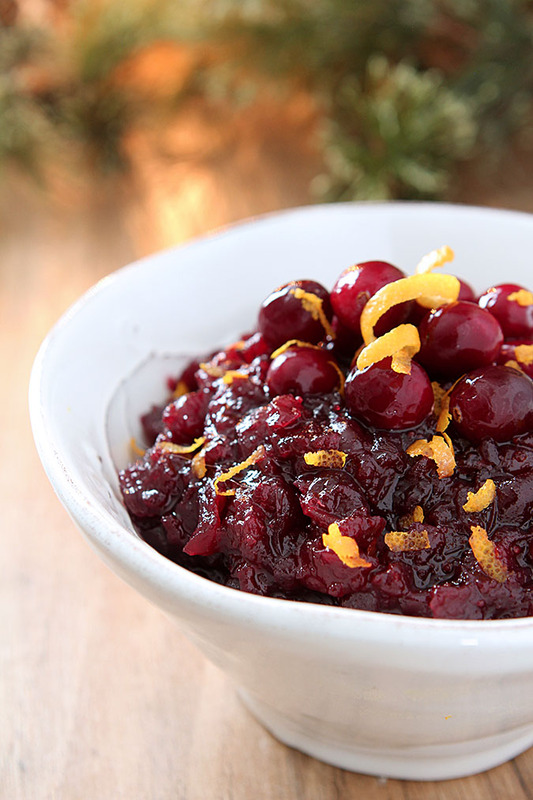 So here it is…a cranberry sauce with bourbon and brown sugar and orange juice that is simply amazing. While I enjoy it for Thanksgiving dinner, my true love is using it for this Turkey, Cranberry and Cream Cheese Sandwich. There is simply no way to describe how the combination of turkey, cranberry sauce, cream cheese, sprouts and sunflower seeds taste but to say it is my favorite sandwich of all time, ever. If sandwiches are not your thing? Then how about for Christmas Day breakfast? I heated some of the sauce with a bit of water to thin it, added a touch of orange zest and finished the mixture with just a bit of maple syrup. Absolutely perfect on waffles. You could make the sauce and the waffles ahead of time and just reheat them in the oven for a super simple yet delicious holiday breakfast. Or just grab a spoon and dig in; that’s what I love the best! Combine all ingredients except the orange and lemon zest in a medium size pot; add a bit more of the juices if needed to just cover the berries. Simmer on medium-low to low about an hour and a half until thick and still chunky. Allow to cool. Add a Tbsp of Orange Liqueur and the orange and lemon zest and combine. Combine the cranberry sauce, water and maple syrup in a small pan. Heat on medium until warm and mix together well. 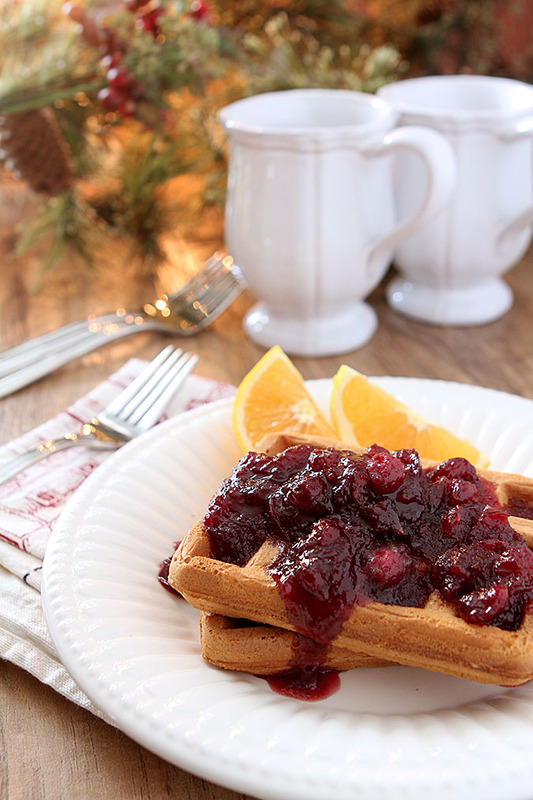 Serve on top of waffles or pancakes. This looks fantastic and putting it on waffles is simply brilliant! It was so good…I’m gonna miss cranberries bad! This looks amazing. Really. Good. Stuff. 🙂 Love the idea of bourbon. Thanks! I’ve never tried incorporating other alcohols into a dish/spread like this, I normally would only add wine. This is a simple idea and I love it! I’ve done wine too Mary but have to say; I love this better! Love it, great flavor and textures. Thanks Amy; it really is amazing stuff; now working on using it in a cocktail!